Motorola has updated its deceptively solid Defy ready for the Christmas smartphone buying frenzy – but has it done enough to make us want one? 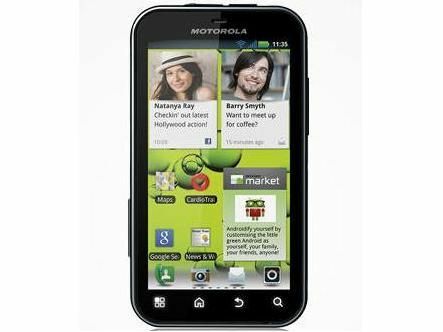 We wanted to be very impressed by the Motorola Defy+, but in the end the update just doesn't do enough to get us going. Motorola's original Defy appeared in the spring and we were impressed with its rugged features, packed into a relatively sleek chassis. Motorola clearly had a lot of positive feedback, because the Defy has returned. The rugged chassis features remain the same, and the Defy+ is water resistant, dustproof and scratch resistant. But the internals have been spruced up for a late 2011 market. So, what's this rugged stuff all about then? Essentially the chassis has been made into a sealed unit, albeit one with a removable backplate. So the backplate itself is held in place by a solid sliding lock and there's a rubber seal around the battery casing with a secondary plastic rim sealing on the backplate itself. There are some screws around the edges of the chassis which don't actually do much to add to the ruggedness, but they do look industrial. More important as far as the Motorola Defy+ edges are concerned is that both the headset slot on the top edge and the micro USB slot on the left are protected by rubber covers. Now, these covers are clearly a good idea, but they are also a bit of a bind. The headset one in particular is fiddly to remove, and you could well find you yank it off completely at some point. Lose these and dust and water resistance will, of course, be severely compromised. A further help in terms of protecting vulnerable parts is that the microSD card is located under the battery. Needless to say this makes hotswapping cards impossible. The screen is made from Gorilla Glass. Once upon a time that was something special. Now Gorilla Glass is everywhere, so the Motorola Defy+ doesn't really have a standout feature there. Add this little lot together and you have a dustproof, water resistant and scratch resistant handset which doesn't look industrial. The Motorola Defy+ feels comfortable in the hand. It is a little thick at 13.4mm, but in a way that just psychologically reinforces that the phone is more solid than most. Its other dimensions, 107mm x 59mm won't trouble your pocket, and it weighs an unproblematic 118g. The shiny edges are perhaps a bit passé to look at, but the rubberised backplate is a good feature. It helps with grip and resists fingerprints, both characteristics of which we approve. The main on/off switch on the top edge was, we felt, a bit awkward to use. There are two reasons for this. It sits quite flat to the chassis, and the casing is angled inwards towards the back, so you have to reach round a little when accessing it from the front of the phone. On the right side there is a volume rocker and this is a bit on the small and finicky side to use too. The tricky little buttons are not a deal breaker, but they are a small point of note. We tried the same test on the Motorola Defy+ as on the original Defy, running it under a tap for several minutes when it was switched on. It didn't stop working, though it is worth noting that capacitive touch screens don't actually work well when they are wet! Like we said at the outset, the chassis is no different to that of the original Defy, but the innards have been upgraded a bit – but just a bit. So we have Android 2.3 instead of 2.1, the processor runs at 1GHz instead of 800MHz. and the 1540 mAh battery has been replaced by a 1700 mAh one. There's still 2GB of storage provided on microSD card, and just over 1GB free internally too. The camera is stuck at 5 megapixels and the screen remains a 3.7-inch 480 x 854 pixel panel.